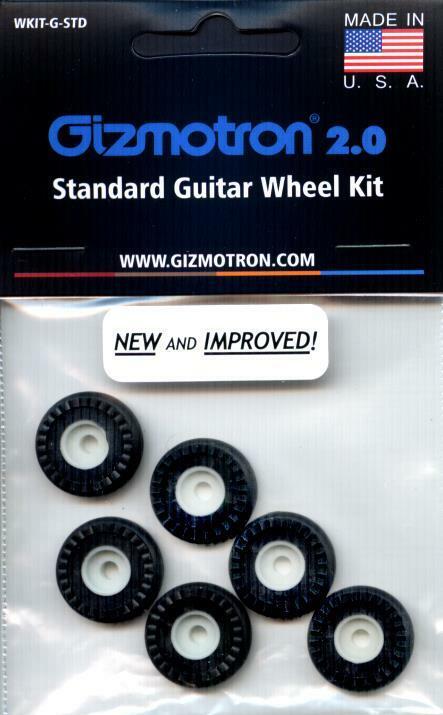 Introducing a MAJOR improvement for Guitar Gizmotron 2.0 owners:ULTRA-LIFE White Guitar Gizmotron Wheels More than 3X the lifespan of the original black guitar wheelsIncreased attack and powerWarmer, fatter toneImproved feelEasier adjustment100% compatible with short-scale guitarsLeaves no residue behind on shaft... read more. 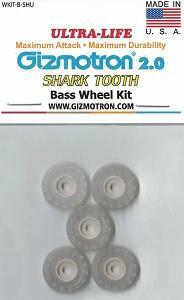 Utilizing the latest in material technlogy,we have re-designed the Bass Gizmotron 2.0 wheels to provide more than TWICE the volume, TWICE the bass, and TWICE the lifespan of the original bass gizmotron wheels.With this advancement, the Bass Gizmotron 2.0 now has the attack power to be used with all types of flat wound and tape wound bass strings.The New ULTRA-LIFE Shark Tooth Bass Gizmotron wheels will be shipping in November 2018 and will be included as the standard wheel on all Bass Gizmotron models. ... read more. 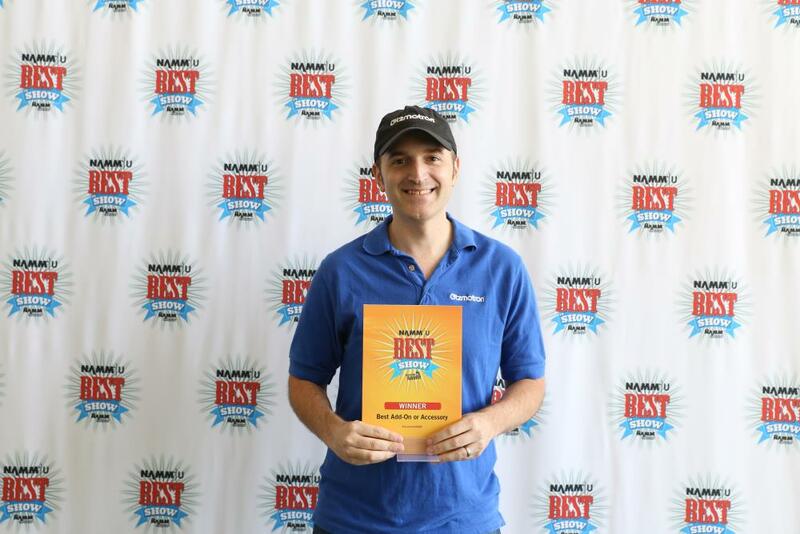 We are excited to announce that the Gizmotron 2.0 has won BEST IN SHOW at the Summer NAMM 2018 for Best Add On/Accessory!https://www.namm.org/nammu/best-show-5... read more. Read about the extreme accuracy required to machine our Gizmotron shafts to precision tolerances right in Cleveland, Ohio. 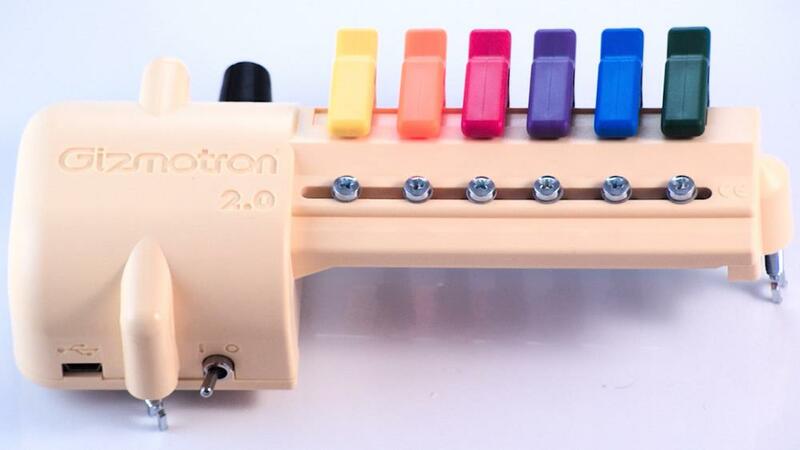 Straight from the 70's, we've brought back the Rainbow Keys for the Guitar Gizmotron 2.0!The rainbow keys are available on any color Guitar Gizmotron 2.0! ... read more. We had a great time exhibiting at Winter NAM 2018. Good to see some old friends and make new ones! Leland SklarVernon ReidPaulo Xisto Pinto of Sepultura ... read more. 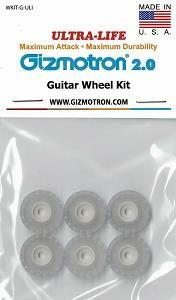 The Gizmotron 2.0 just keeps getting better!On 4/1/17, the Soft-Tooth (Plain String) wheel teeth were made 100% larger for louder, fatter tone and longer life!Buy Direct: https://www.gizmotron.com/buy/guitar-wheel-kit-standard... read more. 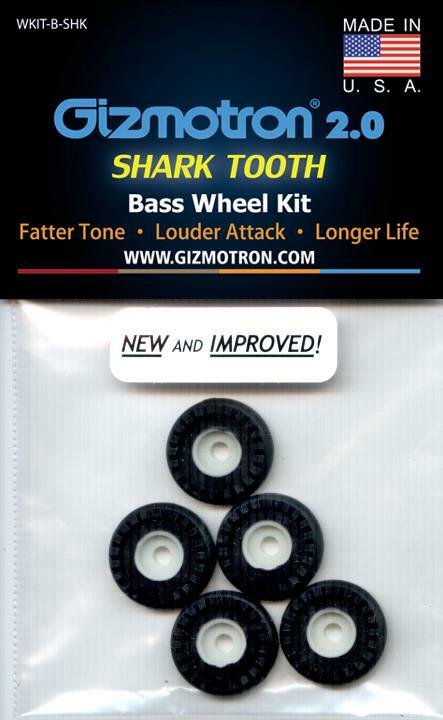 NOW AVAILABLE FOR THE BASS GIZMOTRON 2.0!The Shark Tooth Bass Wheel Kit features 35% larger teeth for a fatter tone, louder attack and longer life.Buy direct: http://www.gizmotron.com/buy/shark-tooth-bass-wheel-kit... read more. We had a great time exhibiting the Gizmotron 2.0 at NAMM 2017 in Anaheim, CA! This was our 4th NAMM show and we are always overwhelmed with the positive response we receive at every show. 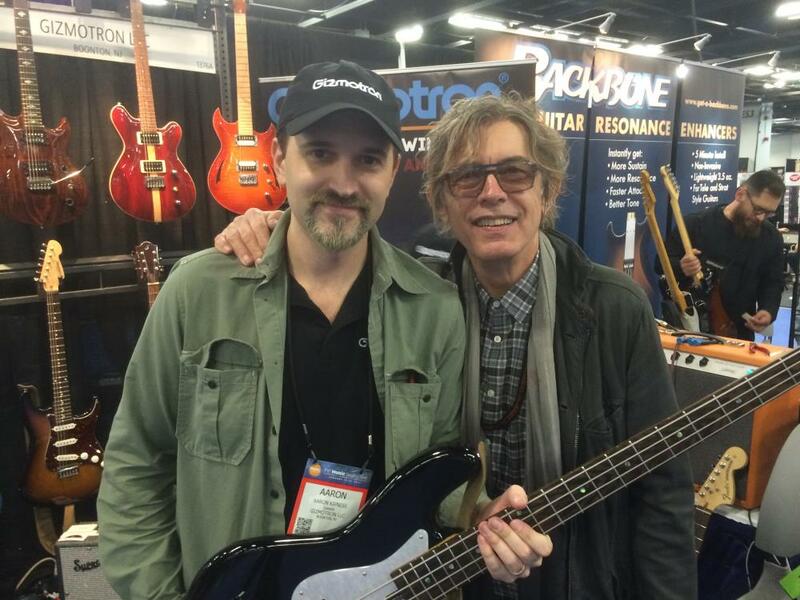 Special thanks to Phil Jones Bass for providing us with amplification for the bass Gizmo, and thanks to Sweetwood Guitars for sharing the booth with us.We made a lot of new friends and some old friends stopped by to visit us like Tom Petersson of Cheap Trick. 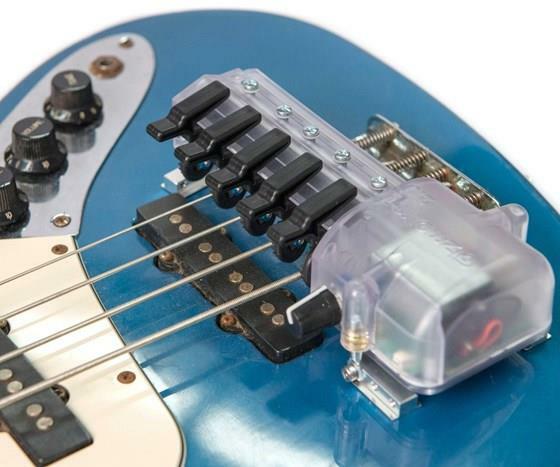 We look forward to seeing you all at the next NAMM show!... read more. Gizmotron LLC is proud to announce the November 2016 availability of new Extra Heavy Copper Spring Arms for the Gizmotron 2.0.These new extra heavy copper springs arms offer a fatter tone, faster action and are resistant to bending.... read more.